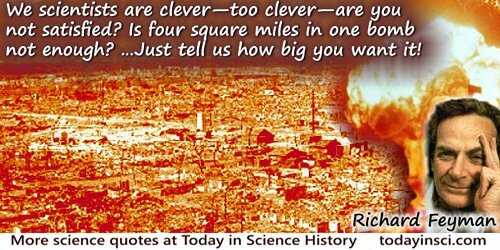 American theoretical physicist who was probably the most brilliant, influential, and iconoclastic figure in his field. His lifelong interest was in subatomic physics. In 1965, he shared the Nobel Prize in Physics for his work in quantum electrodynamics. 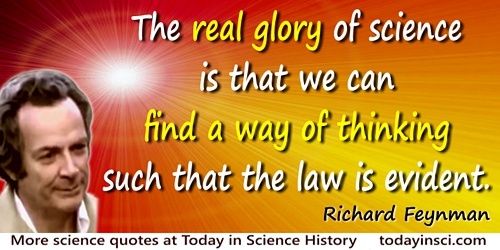 But the real glory of science is that we can find a way of thinking such that the law is evident. The Feynman Lectures on Physics (1965), Vol. 1, 26-3. In Carver A. Mead, Collective Electrodynamics: Quantum Foundations of Electromagnetism (2002), 1. As quoted in James Gleick, Genius: The Life and Science of Richard Feynman (1992), 204. [To a man expecting a scientific proof of the impossibility of flying saucers] I might have said to him: “Listen, I mean that from my knowledge of the world that I see around me, I think that it is much more likely that the reports of flying saucers are the results of the known irrational characteristics of terrestrial intelligence than of the unknown rational efforts of extra-terrestrial intelligence.” It is just more likely, that is all. It is a good guess. And we always try to guess the most likely explanation, keeping in the back of the mind the fact that if it does not work we must discuss the other possibilities. In The Character of Physical Law (1965, 2001), 166. 11 May - short biography, births, deaths and events on date of Feynman's birth. Richard Feynman on The French Curve: a reflection on thinking inside the box. Genius: The Life and Science of Richard Feynman, by James Gleick. - book suggestion.